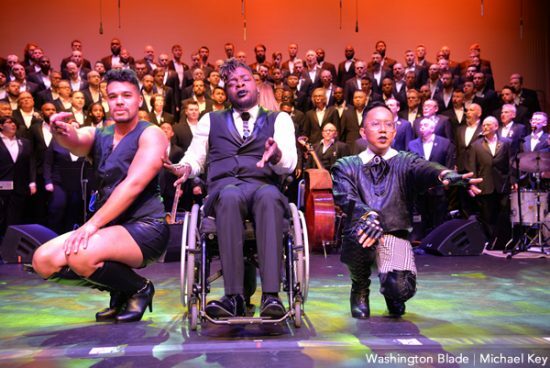 Gay Men’s Chorus of Washington, DC performs “Free Your Mind” in their concert “Let Freedom Sing.” Photo from Washington Blade by Michael Key. …the concert overall was extremely powerful and provided a wonderfully varied repertoire of music from classical to pop to spirituals to hip-hop to gospel to Broadway. “Let Freedom Sing” is the concert that grew out of Kano’s months of conversations with those members about what it is like to be both black and gay in America. A few of them shared their insights with us during the concert in monologues, one of the deeply touching concert features that Kano has introduced to GMCW with great success. We were treated to a trio of fierce soloists in “Free Your Mind” and the entire first act took us from one showstopper to another, while varying the musical styles to keep the pace fresh. Especially amazing was soloist Joval Martin in “If I Can Help Somebody” – he truly sang his heart out and ripped mine to shreds with his emotion. I also have to acknowledge the GenOUT Chorus (made up of LGBTQ+ teens and allies) for their lovely vocal tone, especially the sopranos. I appreciate very much that their director Dr. C. Paul Heins challenges the teenagers to perform classical art songs to build their technique and vocal mastery while they are young. My one criticism for Act One is that while singing the powerful gospel standard “Total Praise,” the chorus sang the lyrics “I lift my hands in total praise…” – without lifting their hands! I know the GMCW can perform even complex choreography well as a full chorus, and that was quite incongruous to be singing about lifting hands without doing it. Act Two featured some powerful selections – notably “The Crossing” with soloists Rob Hall, Garrick Jordan, Ellery Rhodes, and Jimmy Tam; “Glory” with soloists Tyrel Brown and Joshwyn Willett, which was without a doubt the most intense piece of the entire show (which made for a quite jarring transition when it was followed by disco music – “I’m Here” would have been much better after a memoriam piece for lives lost to violence); and “I’m Here” with a gorgeous solo to the biggest applause of the night by Thomas Hudson, who just broke our hearts with his vulnerable strength. However, Act Two dragged on a bit too long and could have been greatly aided by condensing the multiple medleys to only include a single verse and chorus of each song instead of almost full-length renditions. Despite the length of Act Two, the concert overall was extremely powerful and provided a wonderfully varied repertoire of music from classical to pop to spirituals to hip-hop to gospel to Broadway. I would highly recommend “Let Freedom Sing” but sadly, it was a one-day show, so I can only recommend that you make sure not to miss the next concert of Gay Men’s Chorus of Washington, DC under the artistic direction of Dr. Thea Kano. “Let Freedom Sing” has finished its run. For more information on upcoming performances of GMCW, click here.